Dear leftists, I understand that you do not like your ideas to be challenged in the arena of free thought, after all you all tend to believe in the group think mentality. It is the reason you are drawn to unions and drum circles. I also understand why you think us conservatives are mean, after all we will engage anywhere and at anytime and 9 out of 10 times we win the debate. 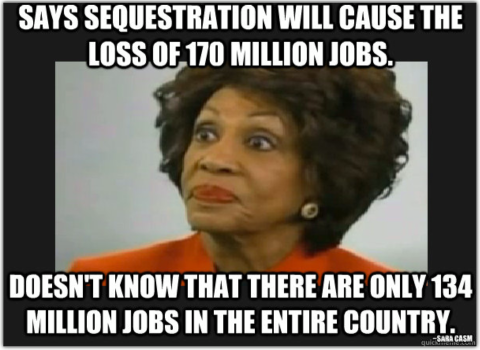 That’s right, according to your race baiting leader Maxine the US will lose more jobs than it currently has and all because a 2% in government spending to boot. LIberals you wonder why we do not take you seriously, it is because you do not hold your leaders accountable. Please find a few of you that make some semblance of sense and let’s have the national debate we need. In short you need to stop bringing pocket knives to a gun fight.